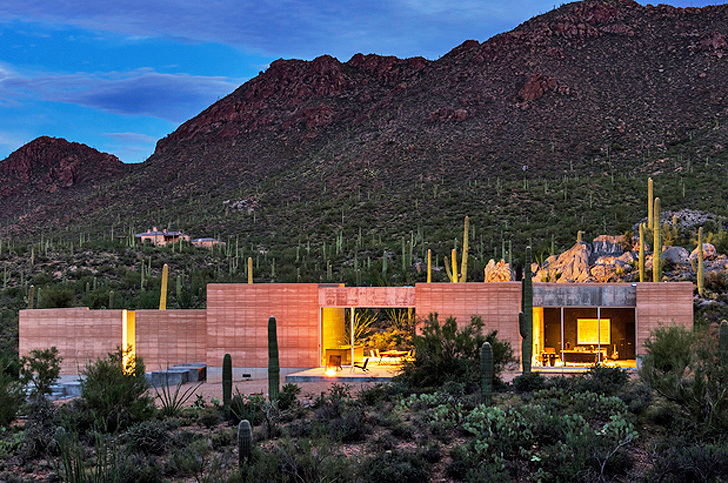 This lovely rammed earth home is surrounded by giant Saguaro cacti in the Sonoran Desert. The Tucson Mountain Retreat by local firm DUST is an exercise in connected living with the environment. Low-impact construction works in conjunction with solar passive design to create an environmentally friendly home. 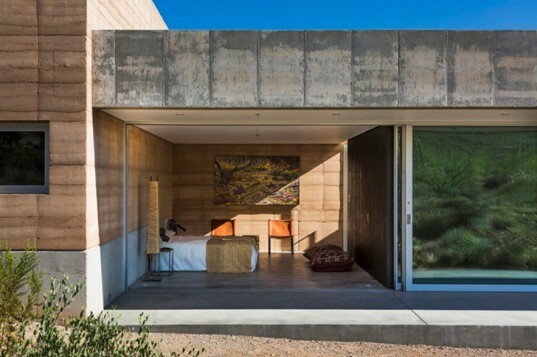 The home features rammed earth walls made from local soil, and it collects its own rainwater for use on the property. Located outside of Tucson is this mountain and desert retreat designed to enjoy the surrounding landscape while minimizing its impact on it. Local architects DUST sited the home carefully within adjacent arroyos, rock out-croppings, ancient cacti, animal migration paths, air movement, sun exposure and views. Parking from the home is situated over 400 feet from the house to remove cars from the home’s space and force the residents and visitors into the desert and engage with it before hiding inside. Other strategies to create a connection between people and the environment include the use of playful concrete stepping stones to enter the home, floor to ceiling glass sliding walls and no internal hallways. To access different rooms within the house, residents must first walk outside to the next room. Residents are at once both protected from the elements, but also must participate with the environment. Oriented to the east and west, the home uses solar passive design to take in sunlight and warmth in the winter and exclude it during the summer. Minimal glazing on the east and west along with large southern overhangs keep the interior from overheating. Prevailing breezes are captured through operable sliding glass walls to bring in fresh air. The home is primarily built from rammed earth created using local soils to provide thermal mass to slow the transfer of heat. In addition, the home is equipped to store 30,000 gallons of rainwater harvested from the roof then filtered and used for all household systems inside. Located outside of Tucson is this mountain and desert retreat designed to enjoy the surrounding landscape while minimizing its impact on it. Local architects DUST sited the home carefully within adjacent arroyos, rock out-croppings, ancient cacti, animal migration paths, air movement, sun exposure and views. Parking from the home is situated over 400 feet from the house to remove cars from the home's space and force the residents and visitors into the desert and engage with it before hiding inside. Other strategies to create a connection between people and the environment include the use of playful concrete stepping stones to enter the home, floor to ceiling glass sliding walls and no internal hallways. To access different rooms within the house, residents must first walk outside to the next room. Residents are at once both protected from the elements, but also must participate with the environment. Oriented to the east and west, the home uses solar passive design to take in sunlight and warmth in the winter and exclude it during the summer. Minimal glazing on the east and west along with large southern overhangs keep the interior from overheating. Prevailing breezes are captured through operable sliding glass walls to bring in fresh air. The home is primarily built from rammed earth created using local soils to provide thermal mass to slow the transfer of heat. In addition, the home is equipped to store 30,000 gallons of rainwater harvested from the roof then filtered and used for all household systems inside. Located outside of Tucson is this mountain and desert retreat designed to enjoy the surrounding landscape while minimizing its impact on it. Local architects DUST sited the home carefully within adjacent arroyos, rock out-croppings, ancient cacti, animal migration paths, air movement, sun exposure and views. Parking from the home is situated over 400 feet from the house to remove cars from the home's space and force the residents and visitors into the desert and engage with it before hiding inside. Other strategies to create a connection between people and the environment include the use of playful concrete stepping stones to enter the home, floor to ceiling glass sliding walls and no internal hallways. To access different rooms within the house, residents must first walk outside to the next room. Residents are at once both protected from the elements, but also must participate with the environment.